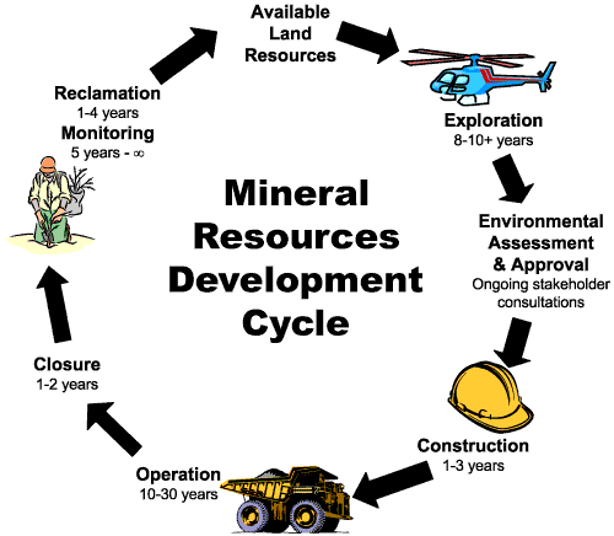 The mining cycle is a helpful way to describe the various activities to find, extract, and produce minerals and metals to meet modern global needs. It begins with early exploration and with continued success, moves to discovery into development to production, and finally closure and reclamation as the land is returned to other use. Every step of the mining cycle provides direct and indirect economic opportunities and companies work with governments and communities to ensure local benefits and environmental protection. Every aspect of the mining cycle is regulated to the highest environmental protection standards. Resources are co-managed by Indigenous and public governments. Exploration is done by prospectors, geoscientists and exploration companies. It begins with research to decide where to look and for what kind of valuable minerals. It’s followed by a variety of geoscientific investigations on the land to try and try and discover a valuable mineral deposit. Explorers must be optimists, as only 1 in 1,000 exploration projects ever becomes a mine. Discovery includes even more geoscientific field work and of course investment to pay for further work when something of value is found. A mineral deposit that is valuable enough to make mining profitable is called an ore body. Many mineral deposits have been discovered in the north that aren’t yet economic to mine. They could become profitable ore bodies if market prices go up, or if costs are lowered through, for example, provision of cheaper power, or road access or new technologies. Development of a mine includes more geoscientific, environmental and engineering work and studies, feasibility studies to prove the economics, and much raising of money particularly for mine construction, which can cost billions of dollars. Only with everything in place, including community support and environmental permits and approvals, is the company positioned to proceed with construction. Construction of a mine generally takes from 2-3 years, requires a large workforce with diverse construction skills, and can cost over $1 billion. Production is the process of removing the valuable minerals from their surrounding rock, not an easy task. Rock is first mined and removed from the ground, then crushed, sometimes ground to a fine flour size, and then put through chemical or non-chemical processes to separate the valuable minerals from the waste minerals. The latter are stored permanently at the mine site, while the valuable minerals are sold in the marketplace. Mining production can support from tens to hundreds to thousands of jobs and can last from a few years to many decades. Some mines have even surpassed 100 years and as a result deliver opportunities and benefits for several generations. Closure and Reclamation is the final work to close a mine and return the site to a safe and natural state. Building are taken down and the landscape contoured. Revegetating is almost universal, and today even with species native to the local area. Reclamation often begins well before closure. Closure and reclamation planning often is planned for even before the mine is built, so that during production, mining can take place in a way to make eventual closure easier. Sometimes reclamation begins during mining in a practice called progressive reclamation. Mines not only complete closure plans but they post significant moneys as security to cover closure costs in the event of an unforeseen bankruptcy, where the government is then faced with doing the reclamation work. Click the links below to watch chapters of this NWT & Nunavut Chamber of Mines video. Produced by the chamber in 2007 (Swan Productions/Milligan MediaWorks), it highlights northern visuals of the mining cycle.